Cranberry hibiscus growing shrub‎ of the genus Hibiscus and also known as Rosemallow, Cranberry hibiscus evergreen perennial plant in cold climate become annual plant also used as ornamental plant, can grow in mediterranean, subtropical, temperate, tropic climate and growing in hardiness zone: 9+ (as perennial) 5-8 (as annual). 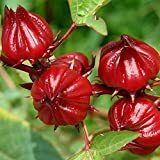 50 Jamaican Sorrel seeds,Florida Cranberry ,Indian Roselle,Hibiscus sabdariffa ! When is the best time to prune a Cranberry hibiscus shrub?